Batch Converter facilitates converting large numbers of files, be them in folders and sub-folders, with 1 click. It is also possible to selectively convert just one audio type, or even a certain bit-rate. Place a tick mark next to the file(s) to convert. Then click Convert and Music Converter takes over. Click Convert >> if redoing the mp3 library add the DSP effect 'Conditional Encode' and set to skip already existing destination files. It is possible to exclude audio types, by clicking the Filter button. Only audio types with a check mark are converted. Filter also allows selection of Artists, or Albums, by default all artists are included, by clicking the 'Exclude All' button, only checked artists are converted. 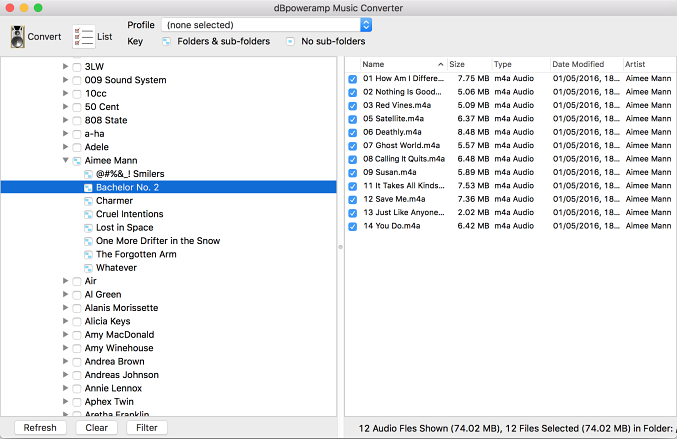 Once all files are selected for conversion, click List, wait for all audio properties to be read then right click on a column header (such as Name) and select the item to sort by, such	as bitrate. By clicking on the bitrate column, tracks are sorted by bitrate. To exclude certain bitrates, select first file, hold shift key and and select last file, next right click >>Uncheck All, only files of a certain bitrate will be converted. If a profile is created, or select a previous profile: all selections are automatically saved to that profile, this also includes all entries under 'Filter' and settings made later in Music Converter. Full [step by step guide] on how to create a lossy library from a lossless collection.